Former Wings frontman, Paul McCartney, was awarded an honorary Doctorate of Music from Yale University yesterday. NEW HAVEN, Conn. (AP) “” Paul McCartney can now add one more honor to the numerous awards, accolades and the knighthood he has already received. 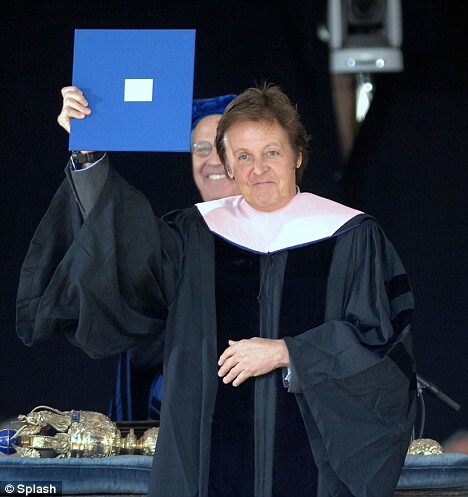 The ex-Beatle on Monday was awarded an honorary Doctor of Music degree from Yale University. In granting the honorary degree to McCartney “” Sir Paul McCartney since he was knighted in 1996 “” the university said no one compares with the legendary songwriter. Yale said the 65-year-old McCartney awakened a generation, giving a fresh sound to rock and roll and to rhythm and blues. A band played “Hey Jude,” a Beatles hit, as McCartney walked on stage to accept the honorary degree. Previous Post Play The Stereofame Game | Get In The Lineup At After The Jump and $2,000 in Cash!